Ottley felt the Choir organization was a 19th-century concept in the way it functioned and knew the Choir could not continue to live in the past while maintaining a national reputation. President Kimball asked Ottley to establish an impartial retirement policy for Choir members. Ottley was tasked with taking the emotion out of retirement, as the then-current process of auditioning and retirement was chaotic and caused problems and divisions among Choir members. After some time and thought, Ottley proposed the new retirement policy of 60 years of age or 20 years of service, whichever came first. The change was very hard for some at the beginning, but they stuck to the policy so everyone knew when it was coming. In 1999, another shift happened when the minimum age was changed from 30 to 25, as the Mormon Youth Symphony and Chorus dissolved and the Orchestra at Temple Square was formed. 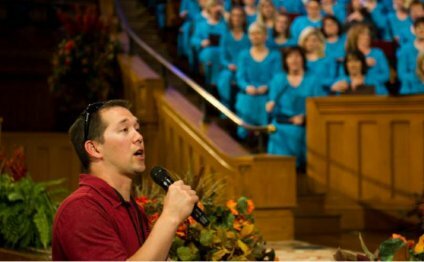 Lowering the age of the Mormon Tabernacle Choir allowed many of these singers and musicians who were younger in age to audition during this reorganization. The change lowered the median age of the Choir dramatically. The same retirement process instituted in 1974 is still functioning well 40 years later! In the video below, the Choir sings the Broadway classic from Fiddler on the Roof, “Sunrise, Sunset, ” in which the lyrics describe change. Yearly changes are inevitable within the Choir, but the quality musicians and message of hope will remain as it has for over 100 years.